The first time since we are in Page the sky is clear when we get up in the morning. Since yesterday was a strenuous day, we take it easy today. First we visit the Horseshoe Bend which is just about 2 miles south of Page. From the parking lot a sandy trail leads over a hill down to the cliff. The Colorado river lies far below us and the bend it takes indeed looks like a Horseshoe. The river looks so calm and small it is hard to imagine that it continues all the way to Mexico and on its way feeds Lake Mead, Los Angeles and San Diego with fresh water – amazing. After grabbing a sub (sandwich) at Subway we head further south on the HWY 89 then turn right towards Marble Canyon. There we take another right turn to Lee’s Ferry. John Lee was the first ferryman in the early 1900s. Imagine the relieve the first settlers must have felt when they found this place where they finally had access to water and could cross the Colorado after traveling through the desert for weeks or even months! 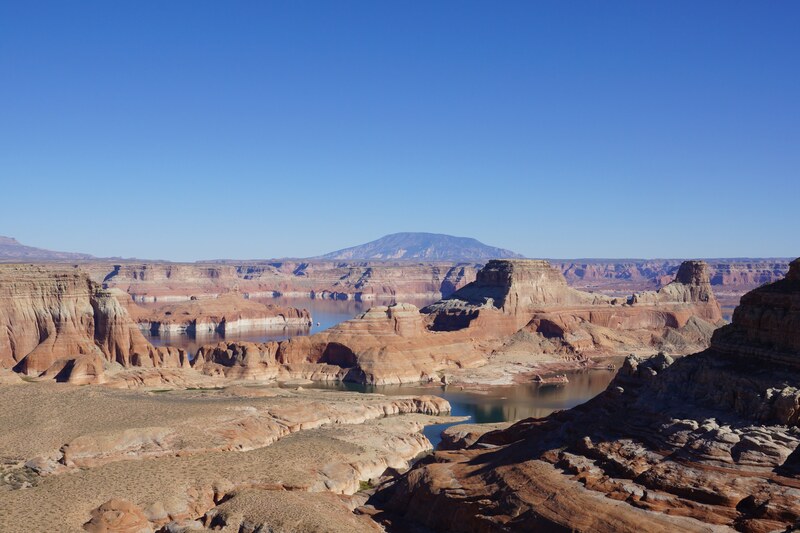 On the way back we stop at Marble Canyon and walk out on Navajo Bridge. Here again, only a few miles away from Lee’s Ferry the river is far down in a deep creek – a wonderful sight! In the afternoon we check in at Debbie’s Hide A Way again and enjoy the backyard. After dinner we drive up to the viewpoint above Lake Powell to enjoy the sunset. We meet Roland a German guy who is traveling through the area taking pictures as we do. He give us some valuable tips.